Until Apple stuck a magnetic holder for its multimedia remote control on the side of the most recent iMacs, it was generally accepted that magnets should be kept well away from computer screens. Now that’s no longer a consideration, we’re starting to see more magnetised material in peripherals, such as this first magnetic keyboard. 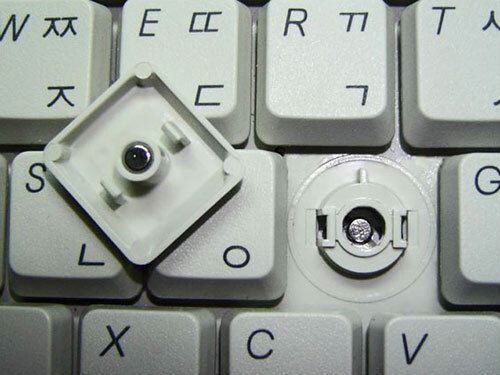 The blandly named Magnet Keyboard comes from Korea’s Embotec and, thankfully, they seem to have put a bit more though into its workings than its name. In place of the switches or springs found in most normal keyboards, the new rack uses magnetism to cushion the keys by levitating them upwards and away from the contacts that register keystrokes. Embotec says the technique is actually better for the hands than current keyboards, as it can adjust the strength of the magnetic field – and hence the cushioning effect – according to how hard the keys are being struck. Apparently, even gamers are likely to approve of the new, responsive keyboard when it is released in South Korea shortly. There’s no word on pricing or overseas sales yet, nor can we link you directly to the keyboard on Embotec’s website. Like most Korean firms, they’re addicted to Flash, so there’s no deep linking, but we’re sure you can find your way around the English links there.